Rather than trying to scare you off, some conservative approaches to basic head porting exist that can add benefit to your next engine. However, it will be important to spend as much time researching as you do grinding and polishing. The object of this tech article is to explain that just “hogging out” the intake port on a pair of heads can easily rob power from your high-performance engine rather than making gains. Today’s internet research is a tool as important as your die grinder when it comes to head-porting basics for the novice. If you don’t believe me, just search online for “cylinder-head porting more harm than good” and view the multiple pages of results. Reiterating, the internet is a valuable tool for the novice. A professional engine shop offering head-porting services is equipped with flow benches, air probes, volume measuring tools, and a litany of high-tech tools. Probably the most valued tool a racing engine shop provides is experience. I always do my port work outside of the shop. I found an adjustable head stand at a swap meet and bolted it to a portable table. Unless you have a separate room to keep aluminum shavings and iron dust out of your clean shop, this is a good option. There are many different head stand designs, such as these economical fixtures from COMP Cams that can hold your work steady. What you do have on your side is the computer you are using to read this story. It provides a fantastic opportunity to learn from multiple online videos and enthusiast chat threads on professional websites. You can get very specific when searching for your upcoming head-porting project with surprising success. For example, I chose a few different head designs and challenged myself to learn via the web, what should be my operating procedure in gaining some horsepower through some simple porting. I researched the best head-porting tactics for small-block Chevy double-hump heads, and iron big-block Chevy rectangle-port heads. I consider learning to find a better head-casting to work with just as valuable as any porting knowledge. Researching the average rectangle-port big-block Chevy “high perf'” head found a wealth of info concerning many key points about where to concentrate your porting effort. One such example includes a “pinch point” which restricts the intake runner near the adjacent push rod area. For port matching your intake and heads, you can find your ideal intake manifold gasket to use as a template. Holley Performance/Mr Gasket offers this port gauge I use with 28 popular port sizes for small- and big-block Chevy heads. The hard plastic material makes scribing your heads easier. Basic head-porting tools will not break the bank. 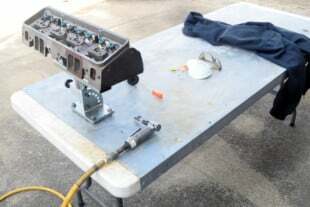 Personally, I am a firm believer that unless you perform this kind of work on a regular (if not daily) basis, such as a full-time professional, an air-powered die grinder is the proper choice. Though admittedly slower than using an electric grinder, the stronger power of an electric grinder can get you into trouble quickly. You can rapidly take away too much material or remove it in the wrong location. Also, you can adjust the air pressure on an air grinder for intricate work on varying aluminum or cast-iron work. 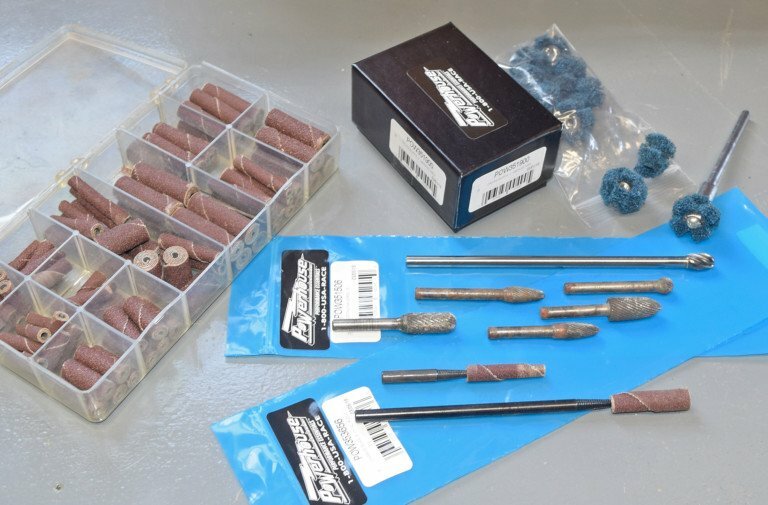 I have built up an arsenal of various shapes and sizes of carbide and abrasive porting bits. Some of the best options are from Powerhouse Products, which offer much longer bits to reach well within your ports. The grinding media can fluctuate as well. Many “porting kits” offer abrasive rolls and stove cutters in different levels of grit. Carbide cutting bits with different cutting flutes are available as well. In both cases, make sure you match your cutters or sanders to the head material you are porting. Another critical consideration exists when it comes to these primary material-removing tools, and that is reach. Your typical hardware store may carry short 2- to 3-inch-long carbide cutters. The same goes for the typical porting kit. There is a mandrel that holds your sandpaper-based porting bits, which are typically about 2-inches long. 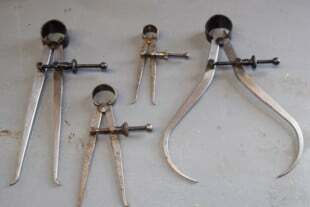 Short of a high-dollar CC burette volume-measuring kit, measuring tools such as these caliper-dividers are a good source for measuring internal-port openings, material thickness, and checking your port work between different ports so they match as closely as possible. You will need a longer reach with both tools when it comes to reaching deep within a head port or blending an intake manifold runner. Specialty companies such as COMP Cams and Powerhouse Products offer longer bits and mandrels to help extend your reach. Great care is needed when using longer burr or sandpaper bits. The further the contact point is from your hands controlling the grinder, the less control you may have. Therefore, shorter bits still have their application. The most fundamental starting point critical for any cylinder head and intake manifold is to “port match” the transition from the intake to the cylinder head. One of the most typical scenarios is an aftermarket intake manifold typically has a larger opening than the cylinder head. Uniquely, the intake we purchased for an engine project had poorly shaped runners that required the majority of massaging. Today’s aftermarket heads — in either iron or aluminum — already have performance port designs. You can typically view the literature to judge the flow rates that take place at specific valve lifts, and know if this will be the head for you. Again, checking the port match with the intake would be the greatest of your worries. To mark your gasket-matching work, many use a machinist's scibing fluid typically referred to as Dykem. A heavy black marker is an easier option to mark the shape of your port work. When doing any porting, wear safety glasses, a breathing mask, and ear plugs. With many factory heads, opening the exhaust port can be a big benefactor for power as well. Your typical header is usually well oversized when compared to the exhaust port. One important note: the walls inside most exhaust ports may have thinner material in relationship to the water passages to increase head cooling. Caution to prevent breaking through to a water jacket is a must. Professional head shops with experienced porting technicians know exactly what to do, and where and how much to remove. With the benefit of flow benches, port modeling, and even today’s CNC machining, it can be well worth the money relying on an experienced shop. If you have ever visited the office of a professional race-engine shop, typically they have cutouts of many different heads lined up on the closest filing cabinet. 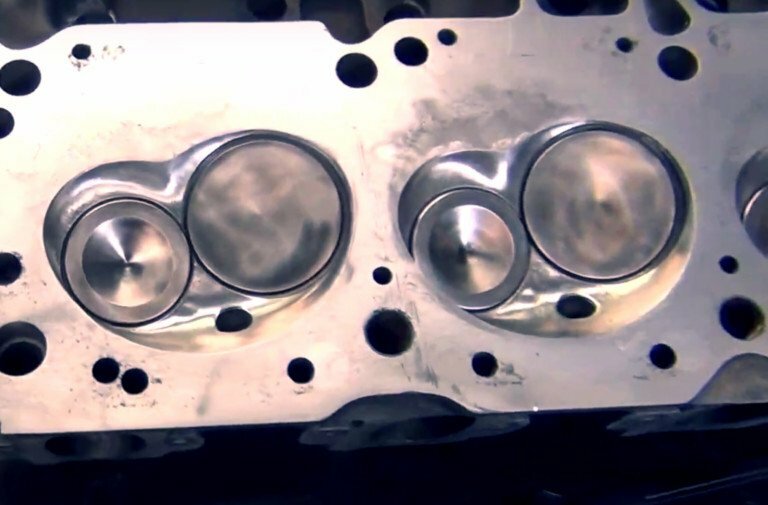 Many cylinder-head manufacturers will supply these “cross sections” to the professionals for analysis of the shapes and thicknesses the products offer. It’s that type of knowledge they have, which a novice does not. Before you think I am trying to talk you out of porting your own heads, I am most certainly not. I just want you to know your limitations, and your cylinder heads’ limitations. Many OE cylinder heads have a restriction just prior to the valve seats. Careful enlargement of this area can wake up horsepower. Avoid grinding around good valve seats. These heads may not look pretty at the moment, but clean up, hot tanking, and new valve seats will follow our porting job. For those not afraid of digging in, you can study from a wealth of written books, websites, and experienced friends to do a proper porting job on your particular head castings. We earlier mentioned the General Motors Vortec head. It is a perfect illustration of the engineered port “velocity” you don’t want to mess with by increasing the runner shape or size. The power gains from this flow velocity and a matched wedge combustion chamber can easily be “ported” into ineffectiveness. Aside from port matching, locating the point of the most significant restriction is your next step. Again, research, research, research. Many heads have a port restriction where “pocket porting” can have a very positive impact. 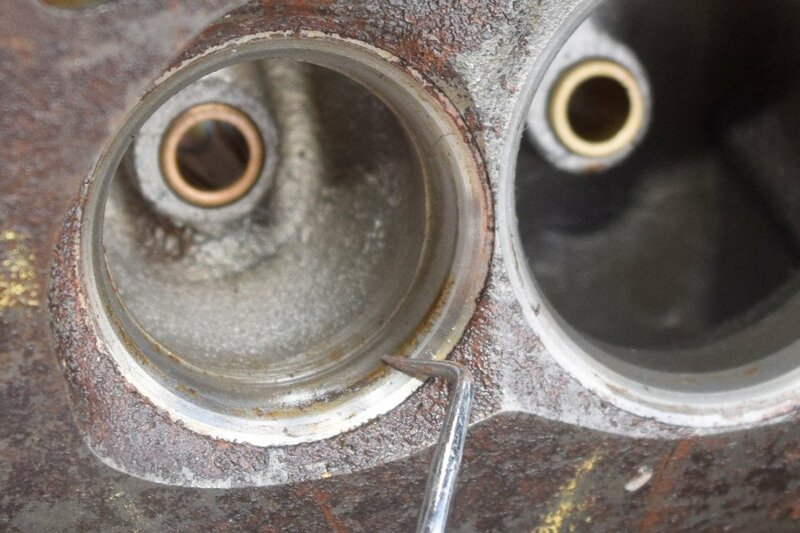 Pocket porting refers to cleaning up the port runner area approximately one-inch before the intake or exhaust valve seat. Carefully opening that area closer to the valve seat diameter can wake-up many heads from 15- to 35-overall horsepower. When performing any work around the valve seat area, it is extremely wise to avoid grinding near the valve seats and possibly damaging the seat surface. On our current head project, we planned for a thorough hot tank cleaning and new valve seats following our porting job. Carbide cutters vary for the material you are working. A crosshatch cutter works best for iron while a single flute cutter prevents aluminum from clogging your bit. I prefer to use air die grinders compared to an electric grinder to prevent overly aggressive porting. I rotate between straight and angled grinders depending on the area I'm working. Remember, just because a port may begin to narrow in height or width as it becomes closer to the valve area, it doesn’t mean there is a restriction. Ports are sometimes purposely designed that way to increase flow velocity. One of the final suggestions for the novice port-job concerns the surface finish. One of the biggest misnomers is that a mirror finish will promote better flow. Especially on the intake side of your intake runner and head port, a polished surface can impede what is called “wet fuel flow.” A rougher surface, simulating an as-cast finish prevents fuel deposits from accumulating on the walls. The surface finish on your port work is critical. You do not want a polished surface on any intake runner, as to prevent your air/fuel mixture from forming droplets of fuel. The opposite goes for polishing the combustion chamber. A polished finish can prevent some heat from absorbing into the head. On the contrary, polishing each cylinder chamber area of your heads can cause a good effect in performance, by reflecting the combustion heat away from the head material. This polished surface results in a more-efficient combustion burn. No great amount of material removal is necessary or desired. Polishing can be accomplished by using abrasive cylinders. 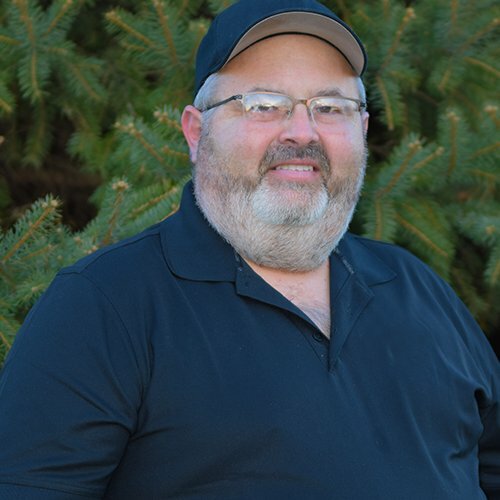 Great care is essential when working around the chamber or pocket porting, so as to not damage your valve seats, spark-plug threads, or the head deck surface. Porting can be an interesting challenge for the hands-on performance enthusiast. Waking up your heads to more power is an art form as much as a practical performance modification.